The underside of a Pisaster ocraceous starfish shows the tiny tube feet it uses to eat. On the rocky beaches of the Pacific Northwest, purple and orange starfish add bright splashes of color to the low-tide landscape. The spiny creatures appear to coexist harmoniously with birds, mussels, and other creatures. Not so. 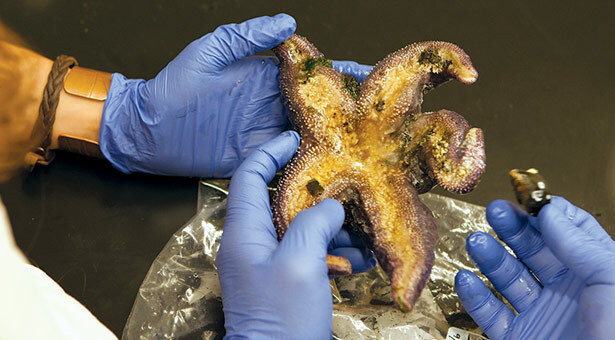 “Starfish don’t look it, but they’re ravenous predators,” says Ryan Ferrer, associate professor of biology at Seattle Pacific University. To eat a mussel, a starfish surrounds the bivalve and pries opens its shell with the tube feet that cover the starfish’s underside. Once the mussel is open, the starfish’s stomach oozes out of its mouth area and pulls the meat inside its own body to digest it. All that’s left of the mussel is an empty shell. Ferrer studies the interactions between starfish (Pisaster ochraeus) and other creatures in the rocky intertidal ecosystem of Puget Sound. Specifically, he studies how paralytic shellfish toxin, a naturally occurring chemical caused by algae overgrowth, affects starfish. If you were to eat shellfish containing this toxin, you could die from paralysis in less than 30 minutes, warns the Washington State Department of Health. But starfish, according to Ferrer’s preliminary research, don’t seem to be bothered by it. Among his questions: How much toxin do starfish absorb when they feed on toxic mussels? Do starfish avoid eating toxic mussels in favor of less-toxic food? And do shorebirds preying on starfish avoid eating them in toxic environments? Ferrer aims to tailor research opportunities to students’ interests and encourages them to be self-directed. “The projects are theirs,” he says. She spent much of the summer of 2012 taking notes and recording video as she watched glaucous-winged gulls prey on starfish. Some days were action-packed, with gulls fighting over the starfish. Other days, no shorebirds showed up. But those days weren’t wasted. If no birds appeared, they could think about why the birds weren’t there. “It was part of our research question — to create the big picture,” Cutting says. One of the big-picture questions Ferrer says he hopes to answer is whether paralytic shellfish toxin functions as a “keystone” molecule — a chemical with an outsized effect on its environment. Ferrer co-authored a paper that appeared in BioScience in June 2013, putting forth the idea of a keystone molecule, and he’s now testing this theory in the rocky intertidal zone as part of his data-gathering. The big-picture perspective is valuable for students.“It helped me see science as a story,” says Cutting.